bouldering while for experienced climbers they serve as a social hub as well as a place to train during the cold, wet and dark days of winter. 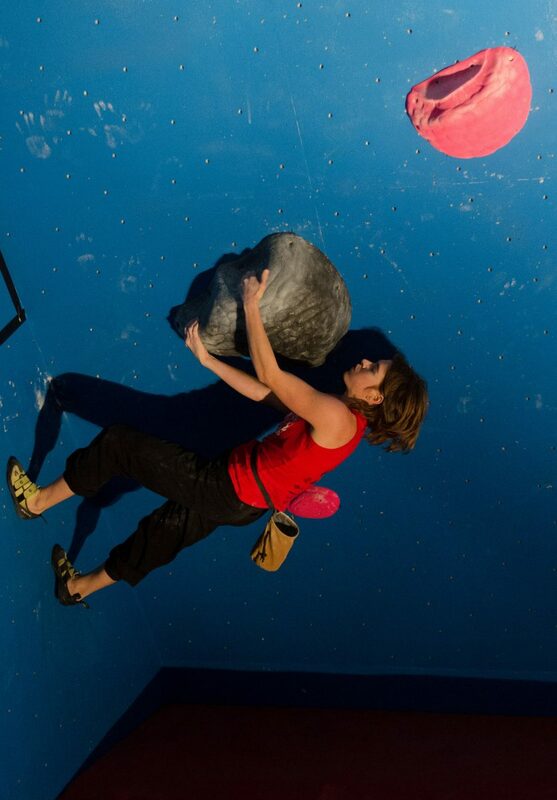 This article contains some general advice on the fundamentals of bouldering indoors at the climbing wall or gym. 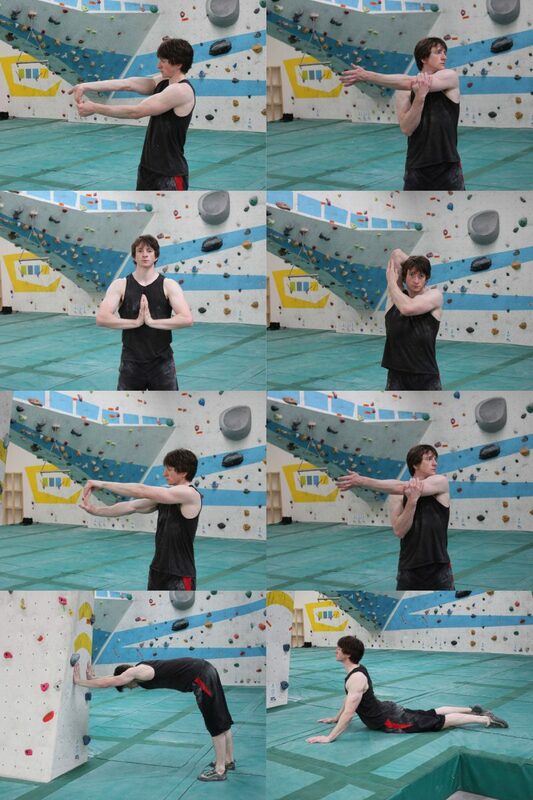 And while bouldering indoors and outdoors have much in common, there are many subtle differences. In the next article I will address some of the issues unique to bouldering outdoors. A thorough warm-up is essential if you want to climb well and avoid injury. Get into the habit of warming up and be patient, it can take up to an hour before you are ready to climb at your limit. PULSE RAISER If you haven’t walked or cycled to the wall then do a short jog or some skipping to get the blood flowing. A few minutes is sufficient. STRETCHING Gently move your fingers, wrists, elbows, shoulders, neck, back, legs, hips, and ankles through their ranges of motion, focussing on the upper body. Remember that your goal is to lubricate the joints and loosen the muscles, you aren’t trying to increase your range of motion (do that after you are finished climbing). CLIMBING Start by climbing some very easy problems or traversing on big holds, focusing on moving smoothly and efficiently. Gradually increase the difficulty, taking plenty of rest between problems. Climbing and bouldering in particular, are incorrectly seen by some as an activity that requires great strength. And while you can never be too strong, it’s technique that will determine how good a climber you become. To establish good habits try and focus on technique from the very start of your climbing career. Before you start up a problem try and figure out how you are going to climb it. Make a plan – decide what hand and foot holds you are going to use and in what order – and then put it to action. If something doesn’t feel as you expected then you shouldn’t be afraid to improvise. Once you are back on the ground, whether you get to the top or fell, you should review your plan. Ask yourself what worked what didn’t, did you follow your plan exactly, is there any refinements you could make etc. This continuous loop of planning, climbing, reviewing is how you learn to climb. Paying close attention when others are trying your problem can be very useful but don’t fall into the trap of blindly copying other climber’s sequences. Everyone has different strengths, weaknesses and physical attributes so what works for them may not be suitable for you, this is the beauty of bouldering, everyone has to find their own way. Embrace the challenge of problem solving, it’s a central part of bouldering, there isn’t just one single ‘right way’ to do a problem. You will soon learn that there is nothing more satisfying than figuring out a devious solution to a problem that you initially though was beyond you. Balance is the glue that binds all the other aspects of climbing technique together. It’s excellent balance and body positioning that allows talented climbers to do moves that feel physically impossible to other less accomplished, but equally strong, climbers. In climbing terms balance can be defined as the relationship between a climber’s centre of gravity and their base of support. Your centre of gravity is the theoretical point where the entire mass of your body is concentrated, it’s usually just above the belly button. The base of support is the area created by connecting your points of contact (your current hand and foot holds). You should aim to climb in a slow controlled style. While you reach between holds your body should stay reasonably still. There are plenty of situation in bouldering when lunging for the next hold is the right option but if you find your body swinging uncontrollably every thing you move your hands then you need to pay more attention to body positioning and balance. 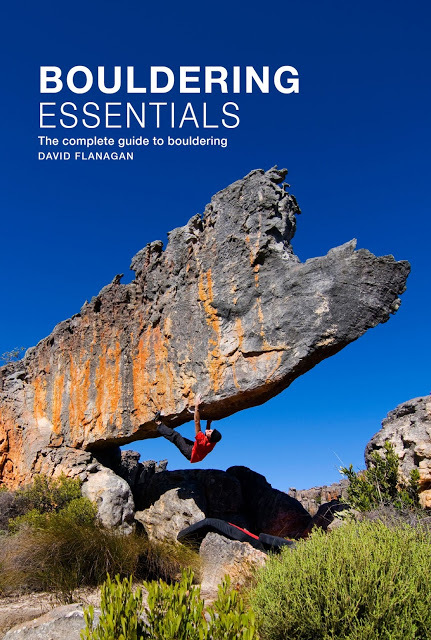 Bouldering Essentials is packed with clear, practical advice for everyone interested in bouldering whether a complete beginner looking to learn the basics, an indoor climber keen to start bouldering outdoors or an experienced boulderer who wants to explore advanced topics such as dynamics, strategy, tactics, training and highballing. With a foreword by renowned climber Johnny Dawes, the book features over 200 stunning photos from the best bouldering areas in the world including Bishop, Castle Hill, Fontainebleau, Hueco Tanks and Rocklands. Bouldering Essentials will provide all the inspiration and information you need to reach your full potential as a boulderer. Buy it now for only €25 including postage worldwide. Success or failure on a problem depends on many factors and often it isn’t immediately apparent which factors are limiting progress. Consider, for example, a climber struggling on a steeply overhanging problem. They are having trouble hanging onto the small holds, let alone moving between them. Their instinct is to blame a lack of finger strength, but it’s just as likely to be a weak core or sloppy footwork that is preventing them from transferring their weight onto the foot holds and away from their fingers. We tend to experience the most pleasure doing things that we are good at. In bouldering terms we spend most of our time climbing problems that suit us. One consequence of this is that our weaknesses, if neglected, become even more pronounced, this drags our overall performance down. Spending time and effort focussing on your weaknesses is an excellent investment as it requires a lot less effort to make large gains in areas of weakness than it does to make small improvements in areas of strength. This is especially relevant for most climbers who have only limited time to train. Warm up well. You will be able to climb better for longer and there is nothing more frustrating than being injured. Never walk or stand in the potential landing zone of a climber on the wall. Get into the habit of checking that the landing is clear before you jump down. Most walls have excellent matting but watch out for gaps, edges or soft spots. Fall properly by soaking up the impact with your legs and rolling onto your side if necessary. Don’t get into the habit of relying on the matting to absorb the impact. around at your options. What’s the worst that can happen? “Bouldering is difficult, that’s the whole idea, embrace the struggle”. Failure is a central part of bouldering, don’t let it frustrate you, be patient and enjoy the process of problem solving. Bouldering is difficult, that’s the whole idea, embrace the struggle. Every climber has different strengths and weaknesses and grades can’t possibly take them into account, treat them as rough guesses that give an approximate indication what problems you may be able for. Don’t let them become the main focus of your climbing. You are not a number. A circuit is a collection of problems of similar difficulty. The circuit concept originated in Fontainebleau, France where aspiring alpinists linked together dozens of problems to build endurance for the Alps. Nowadays most bouldering centres gather their problems into circuits of between 10-30 problems that are identified to colour. Completing an easy circuit is a great warm-up or an easy workout in itself. As most circuits feature a broad range of problems, attempting to do every problem in a circuit (whether in a session or over the course of many sessions) will force you to spend more time on your weaknesses than your strengths. This is an excellent way of improving your technique and raising your all round climbing ability. As enjoyable as bouldering at the wall is, it doesn’t compare to a crisp winter’s day spent bouldering on real rock. Modern walls are so comfortable with their plush matting, heating and cafes that you may be in for a shock the first time you boulder outdoors but once you have experienced the satisfaction and sheer pleasure of bouldering on rock you may never look at the wall the same again. Even the most creative indoor route-setter can’t match the infinite variety of problems created by nature so if you want to learn how to climb, rather than simply get strong, bouldering on rock is the way to go. 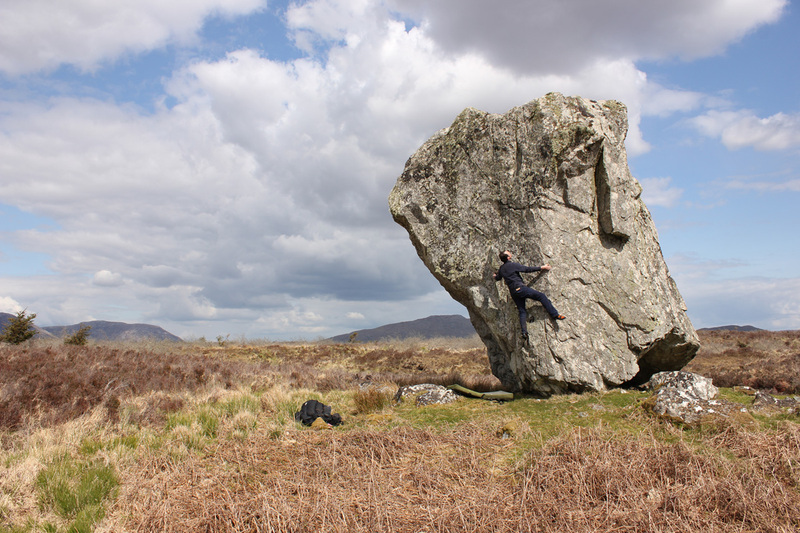 The second article in this series focus on bouldering outdoors, read it here. Found this article useful? Then check out Bouldering Essentials - the complete guide to bouldering. "If you are in your early stages of climbing or know someone who is keen to learn more about this sport then I couldn’t recommend this book enough. Even if you have been bouldering a long time it is a useful coffee table aid to help explain to non climbing friends exactly why it is you don’t just walk round the back all the time." "Where “Bouldering Essentials” really shines is in the attention to detail & tone. Just by looking at the choice of photos throughout you can tell that this book is close to the author’s heart. The real sense of enthusiasm comes through in the writing too, and the end result is that the book feels like having an extremely psyched friend taking you by the hand on a tour through all the best bits of bouldering." "I can't recommend this book enough for the boulderer starting out on the whole adventure - I wish I'd had it twenty years ago. I'd have been a better climber, I'd have touched much more rock and I'd probably have burnt my ropes." "They say a core part of the coach’s role in any sport is to inspire and motivate. Flanagan has clearly taken this on board, and the obvious effort spent on perfecting the visual appeal of Bouldering Essentials has paid off....The array of world class photos is one of the book’s great strengths?....It’s like the book version of your mate who climbs several grades harder than you – there to offer tips, help with tactics and show you the next level really is possible. " "Bouldering Essentials succeeds in not only telling how to play but also inspires to get out there and do it. If you were wondering what to get your bouldering-curious new boyfriend for Christmas, now you know. " "Bouldering Essentials... covers all the basic to advanced training and the focus is defining and describing everything. You can more or less start anywhere and start reading/learning. All-in-all, a good book for the ones who want an informative bouldering book that will make you understand everything the advanced boulderers are talking about during a bouldering session or trip."